Picture this: You head out to the barn after work, walk out to the field, reach around your horses head as you slide the halter on….and “GASP” it looks like he has been punched in the face!! His eye is swollen and puffy and he won’t let you get near it with a 10 ft pole. Yup, I’ve been there. Have you? 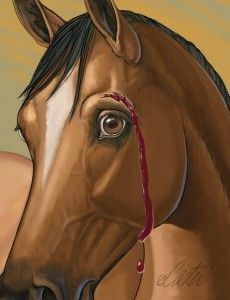 Ocular injuries are one of the most common equine emergencies. Yes, I said it….emergency. “It is just a puffy eye, what is the big deal, I don’t need to call my vet yet” WRONG. Granted, a puffy eye is not the same as a severe colic or broken leg, but is is still a medical emergency that needs to be seen by your veterinarian. “Why?” you ask…. well, lets talk about eye injuries. Horses have the largest eye out of any land mammal and as prey animals they rely on vision for survival. The outer layer of the eye, or the cornea, acts as a barrier or protective layer for the eye. The cornea is very prone to injuries such as scratches or “ulcers”. Corneal ulcers are the most common type of ocular injury in horses. Corneal abrasions, or ulcers, can be caused by almost anything, such as grass seeds, dirt blown into the eye, and just overall horse shenanigans. The outer layer of the cornea is rich in nerves, making injury to this area very painful and irritating. Disruptions to the cornea allow bacteria and fungus to penetrate and can cause severe infections. In certain geographic areas, such as tropical and sub-tropical climates, fungal infections are more common. If the eye becomes infected by a severe bacterial infection or fungal infection, the cornea can become so damaged that they eye “ruptures” through it and the eye will need to be removed. These infections, although rare, can occur at an alarmingly rapid rate. Clinical signs of a corneal ulcer include: swelling, tearing, pain, redness and cloudiness of the eye. Once your veterinarian arrives, they will use a special tool to examine the eye very closely. Sedation may be needed for the exam. After close examination, they will use a special stain that to observe if there are any ulcers, or disruptions, of the cornea. If an ulcer is present, the area will appear bright green. Treatment of corneal ulcers includes a systemic anti-inflammatory such as Banamine, and several eye ointments including an antibiotic and atropine. The antibiotic treats any infection that is present and the atropine dilates the eye. The eye needs to be dilated because when there is inflammation present, a little “muscle” in the uvea called the ciliary body spasms, which is also painful. Atropine relaxes this muscle and alleviates the pain caused by it. Your veterinarian will recommend a treatment plan, including any necessary follow-up exams. Most of the time, corneal ulcers heal very quickly, however sometimes they do not heal, or get worse and become chronic or “indolent” ulcers. So, the moral of the story is to be proactive with a diagnosis and diligent with treatment. 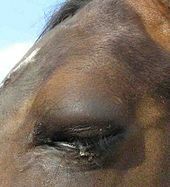 Another common ocular injury in horses is eyelid laceration. These, are pretty much impossible to miss as they often look pretty gruesome. These injuries also required the attention of a veterinarian. A veterinarian will sedate the horse and repair the laceration with small, delicate sutures. Your veterinarian will also likely recommend treatment with Banamine and some ocular ointment. I hope that now you have a better understanding of common eye injuries in horses. Healthy horses and happy riding.